Daisy's Favorite Things | A blog started about my wedding, now focusing on my newlywed life, new motherhood, and my favorite things!!! A blog started about my wedding, now focusing on my newlywed life, new motherhood, and my favorite things!!! I am moving, so that’s why the links/pictures in this post correspond to my other blog! I’m double posting until the move is complete! This was one of the first projects I found in blog-land that I decided to re-create! Ashley of Shanty2Chic made these adorable pumpkins! As soon as I saw these, I knew that I was in trouble- the crafty bug had bitten me! I immediately started searching for other ways to decorate with non-traditional fall colors and came up with some of the other decor you have already seen! 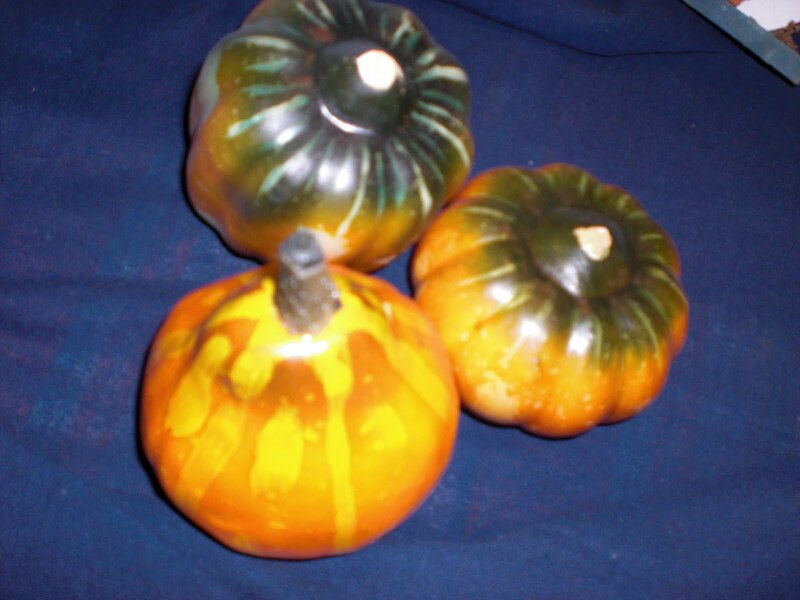 For this project, I already had smaller pumpkins and gourds on hand that I had used before, but never really liked. Here’s a before picture of the little ones- I forgot to take a pic of the big one that I got from the Dollar Tree. It wasn’t nearly as ugly, but I’m not an orange fan! I pretty much exactly followed Ashley’s Tutorial, so check out her post if you want to know how to do these! I used exactly what she suggests- Rustoleum’s Heirloom White Spray Paint and Ralph Lauren Faux Technique Glaze (that I got tinted in “smoke”) from Home Depot, and jute twine from Hobby Lobby. This project would have been pretty cheap, except that the Ralph cost me at least $15! But I used such a teeeeny amount, that it will be good for many, many, many projects to come! The jute twine was $2.99, then I used a 40% off coupon. I’ve already used it on another project and have tons left. The spray paint was just under $4, and I already used it up plus more on the many other things I’ve painted Heirloom White. And the pumpkins cost $1 since I already had the small ones! Here’s how they turned out! 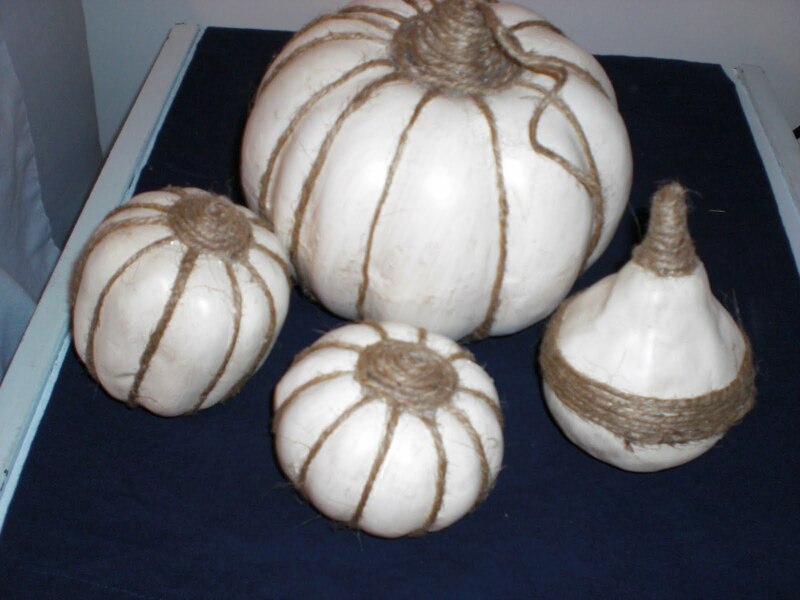 I totally forgot to bookmark the blog where I saw someone else wrap the jute around the middle of the pear-ish shaped gourds! I’d intended to just wrap the stem of those until I saw someone else wrap the centers like I did above. If I come across the blog again, I’ll link it up- or if it was you- let me know!! I thought the big one looked cute with the little “tail,” kind of like some of the vine was still attached, so I just left it there! At first I had them on my TV stand in the living room but then I got inspiration from another blog I’ve just started reading. The above pictures I just took in a random spot near my computer so that I don’t give my next post away yet! More to come on where they ended up! I’m switching the blog from WordPress to Blogger, so that I can link up my two blogs better, make a better template, and so that I can do things like advertise my upcoming etsy shop, etc. Looks like the move will be smooth, but I’ll be switching this around as I play with layouts etc! As a result, you’ll see the same posts for now on BOTH blogs until I get things running smoothly! Then you’ll only see a moved link on the old one and new stuff on the new blog! 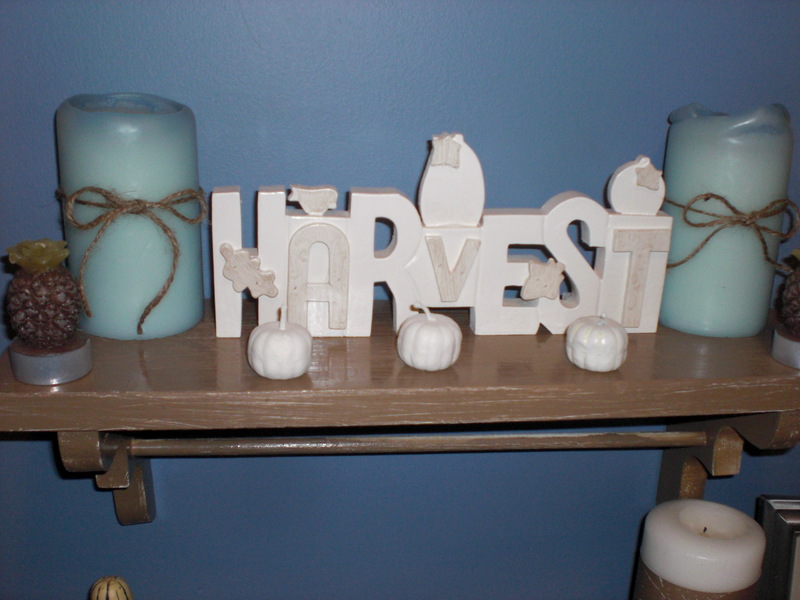 Decorating for Fall with Heirloom White! 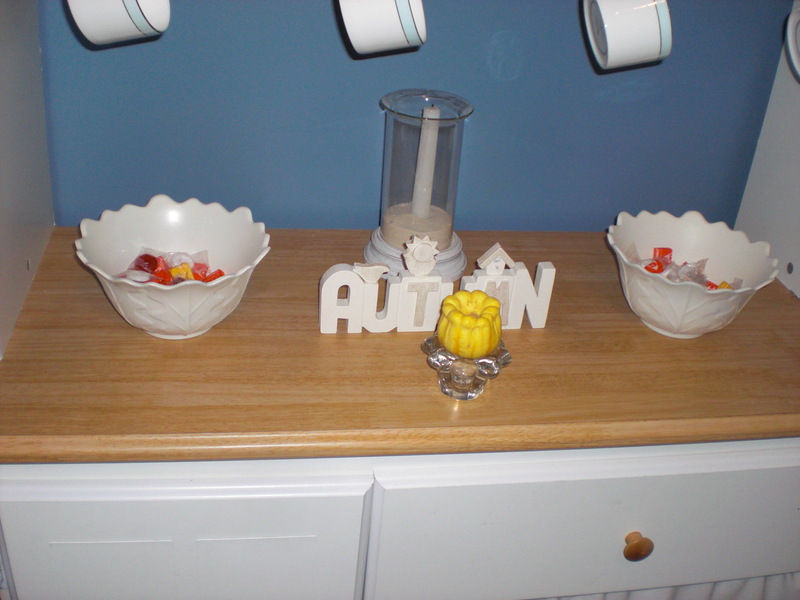 After seeing all the lovely projects the girls at Shanty2Chic have done using Rustoleum’s Heirloom White Spray Paint. I just had to check it out for myself! I’m more of a bright white gal, but I thought that the softer Heirloom White would be a great touch to add to my fall decor! 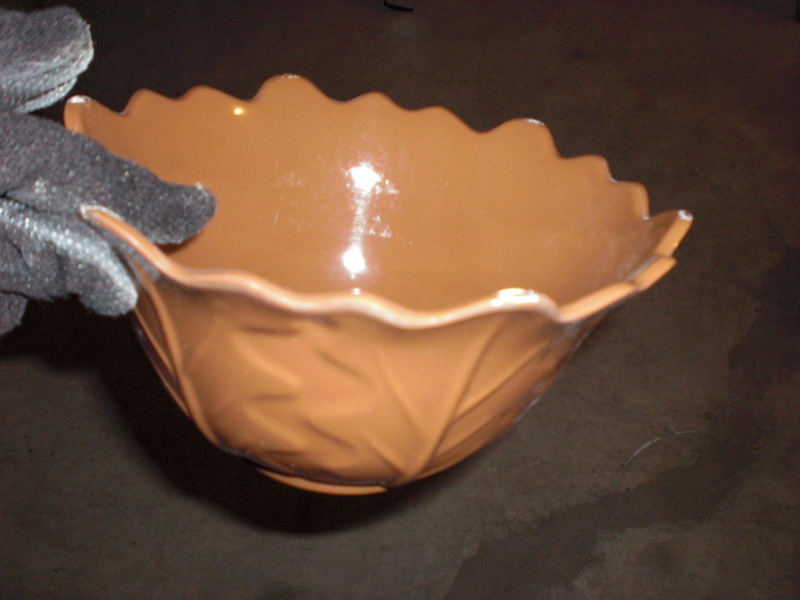 I also purchased some Ralph Lauren Glaze (tinted in Smoke) from Home Depot, as the Shanty girl’s suggest! (I also found that the Rustoleum spray paint is cheaper there than at Hobby Lobby- unless you have a coupon!- and Walmart)I had lots of fall decor that was ugly orange, yellow, brown and green. Well, ugly to me since I’m not a fan of traditional fall colors! They can be great in other people’s houses- just not mine! Here’s some before pics of the stuff I painted with Heirloom White! I also painted a ceramic plate that was really ugly orange and green, some beaded candle garland and some mini pumpkins that I did not take before pics of! Here are the after pics! that doesn’t tempt us, but does tempt guests! 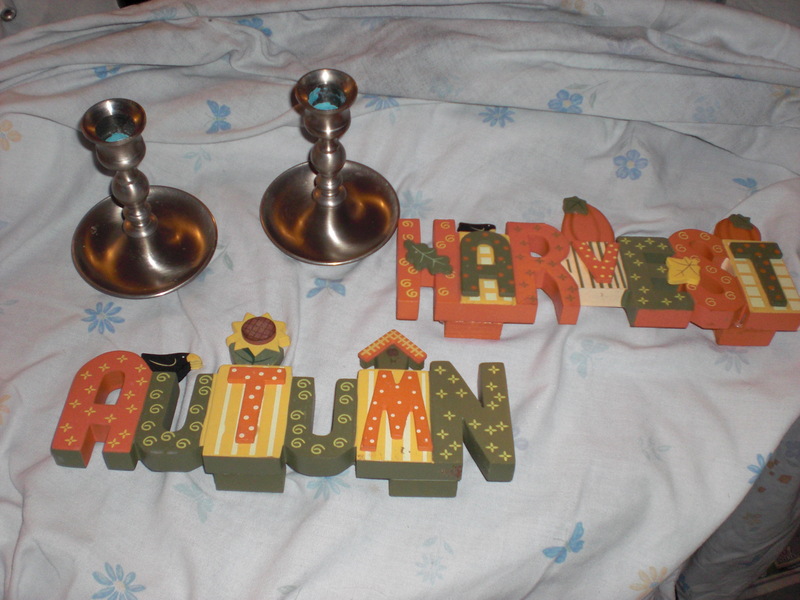 Autumn sign has some of the letters highlighted with Ralph Lauren Glaze. (I’m still working on tweaking this space, not loving it yet. 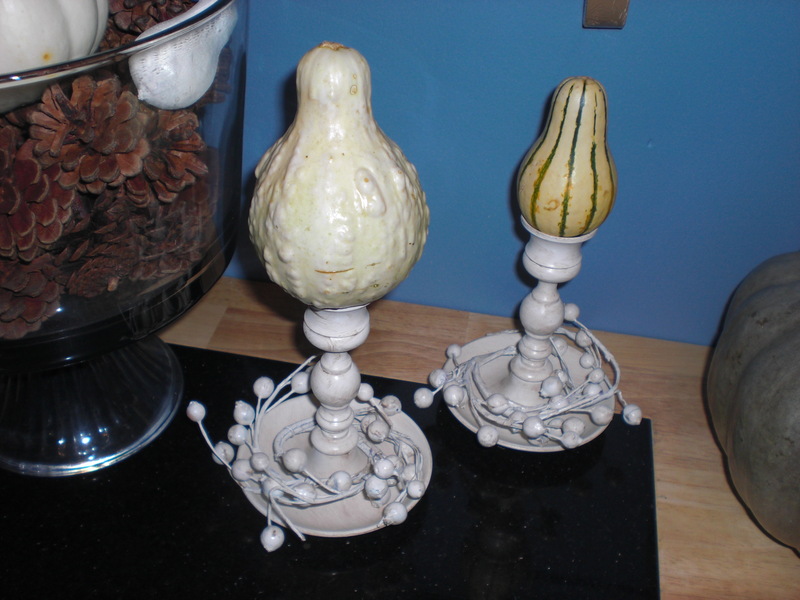 Plate and candle lamp painted heirloom white, lamp brushed with glaze on the pop outs and trim. 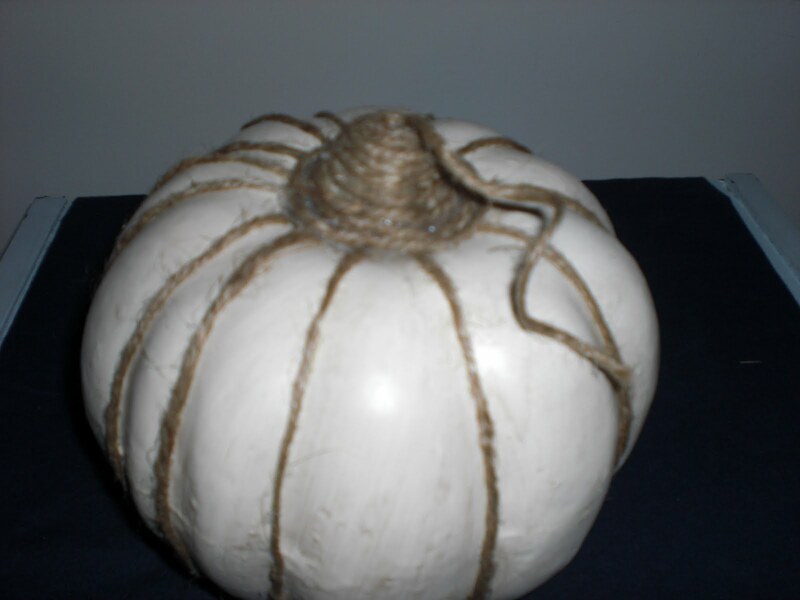 mini orange pumpkins painted Heirloom White. 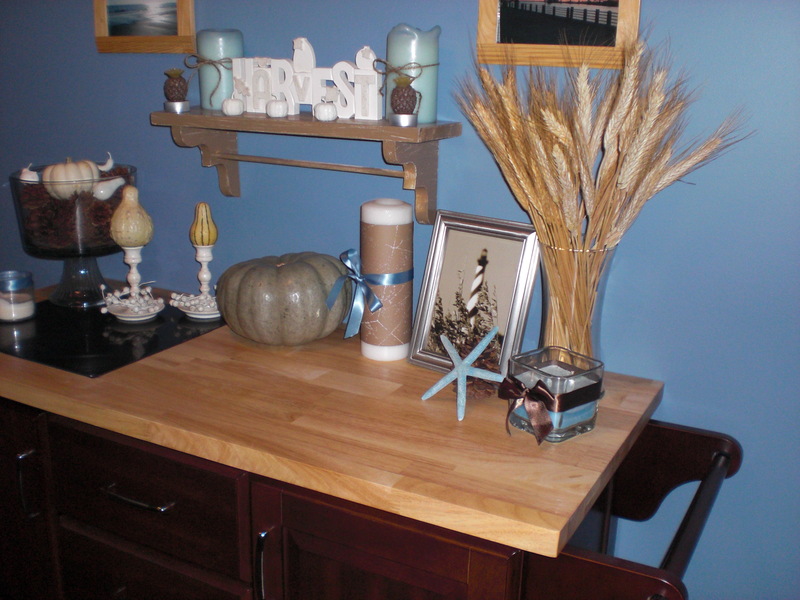 And here’s a look at how it all came together in decorating our dining room area for fall! 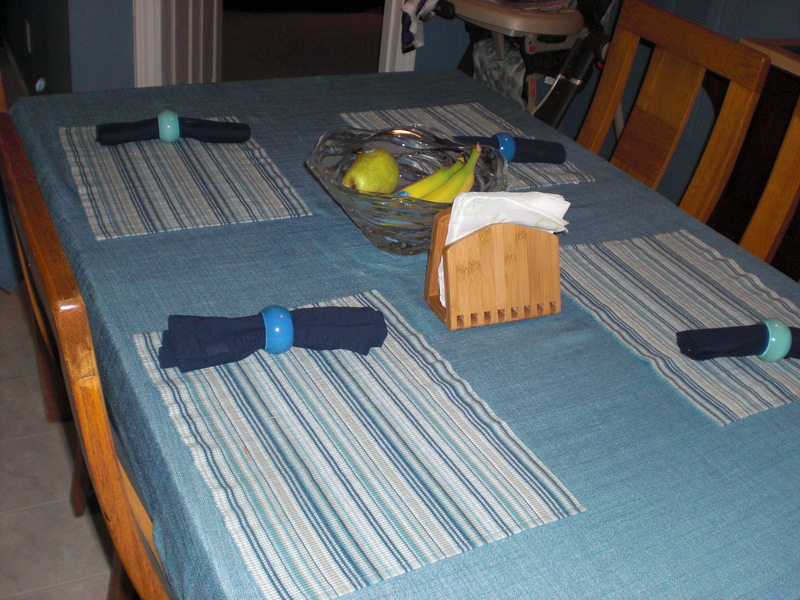 Funny that the tablecloth looks aqua! It’s really about the same color as the walls! One thing I love about the details here, is a lot of them have meaning-things that were already there or that are newly placed! The framed pictures are all pictures I took in NC- mostly Wilmington/Wrightsville beach area. One of my favorite places in the world! The shelf was made by my grandfather who passed away many years ago. The Joy sign was made by my sis-in-law and was our Christmas present last year from her and my bro. The pillar candles and starfish are from our wedding. 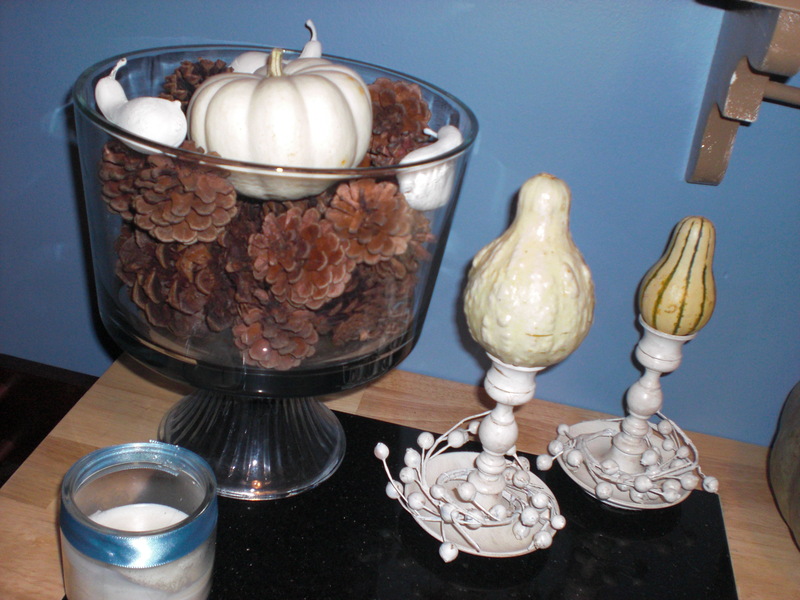 The trifle bowl (with pinecones and real white pumpkin), china, and almost everything in the china hutch are wedding presents. 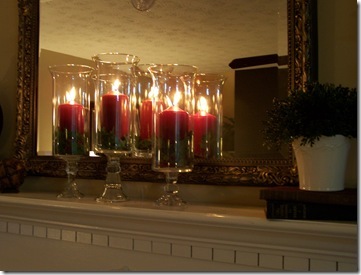 The candle on the hutch behind the candy bowls is an antique find that is a replica of a candle holder at the restaurant from our hotel on our honeymoon in Costa Rica. The high chair shows off that we have a new addition in the family! Hehe! The acorns are memories from Baby Girl’s first hike last week. The pumpkins are from Baby Girl’s first trip to the pumpkin farm! Here’s some closer pics to show you those details! You can also click on any of the pics above for a better view! 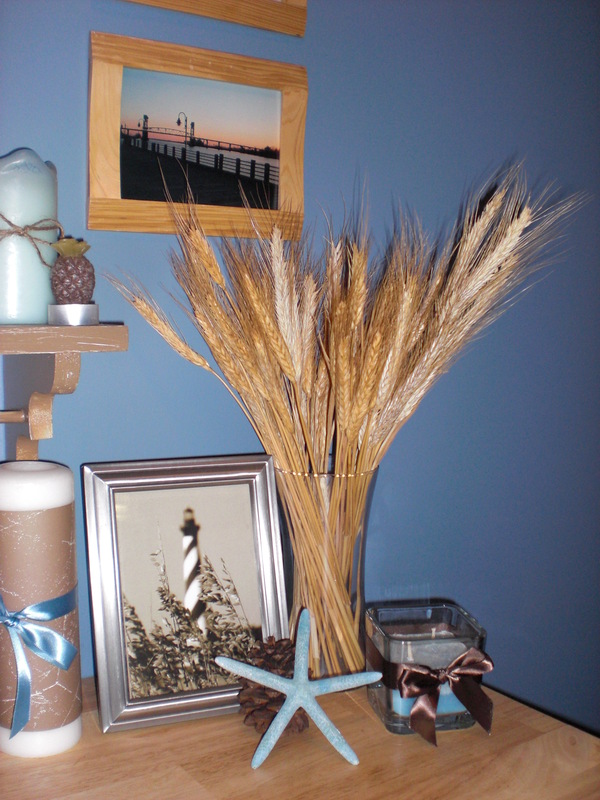 The other touches I added were the jute around the blue pillar candles, the scrapbook paper and/or ribbon around the candles, the vase of wheat, and wheat stalk stuck in the napkin rings. Basically the only things that I bought were the pumpkins and gourds (the gourds I got free at the grocery store since I had coupons that “made” me money! 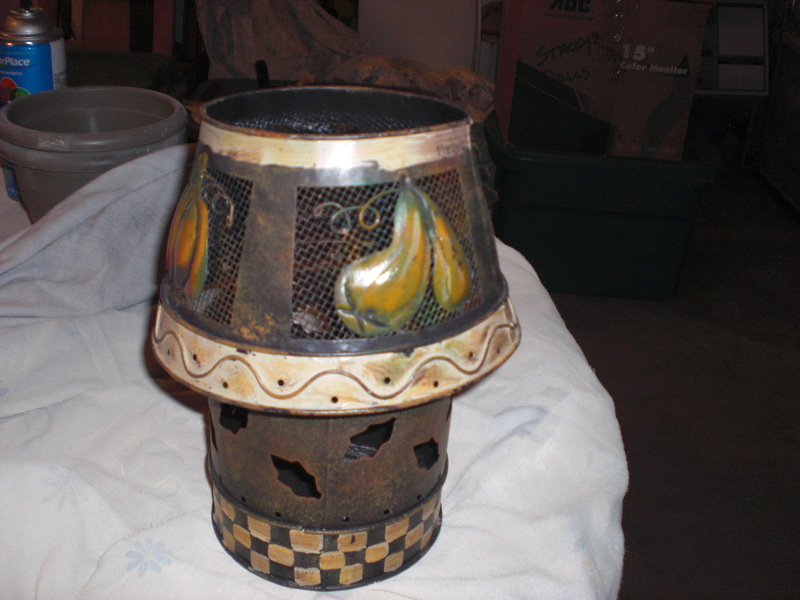 ), the spray paint, and the glaze, but those were really bought for another project I’ll show soon! My mom bought me the wheat at Publix, and it was only $2.99. I “shopped” my house for the ribbon, candles, scrapbook paper, and all the stuff I spray painted I’ve had for awhile. I’m sharing my post at these parties! Visit the links below for more great fall decor ideas! So, I don’t know if my take on this is really considered a fall wreath or not, but I’m loving it anyway! I mentioned before that I wanted to make a wreath like this…. As you can see, mine is turning out a little differently! I think because my wreath was skinner? I’m not sure! I didn’t go look at Christina’s before I started, and just decided to wing it! I’m pretty happy with how it turned out, although I think I would’ve been happy too if I had done it more like hers, which is much, much fluffier! Here is how it turned out! I actually like it better than I thought I would during the process! And looking at how I *should* have done it, I may have liked it better the other way! But I still like it lots as is! 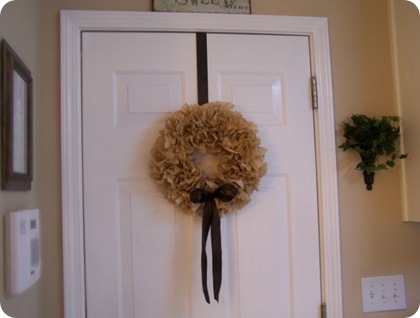 I tied the fabric through one of the loops of the wreath on top, and push-pinned it into the top of the door! Then I hot glued the bow on the bottom! It is hung up on my pantry door, and I love how it fills up big empty space I had no idea what to do with!! The walls on either side of the door are too narrow for much decoration, so it gives that space a little something! I love how well it matches my kitchen and dining room! I’ll post pictures of those soon so you can see, as I do the rest of my fall projects! 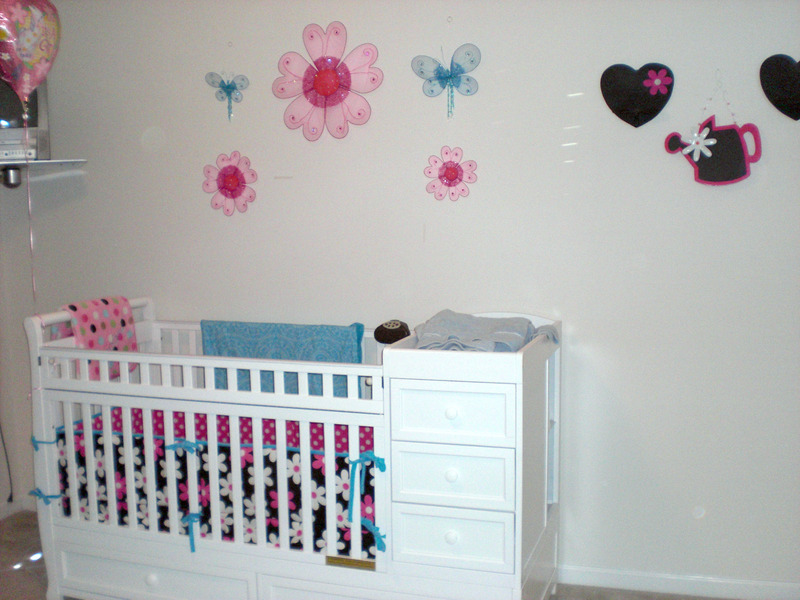 Baby Girl’s room Project #1- Paint and add flowers to mommy’s old shelves! My grandfather loved to make things out of wood. Shelves, animal cutouts, all kinds of things! My mom and I have held onto several of his things, and I have used them throughout my house over the years. I always had some of his shelves in my room growning up as well. 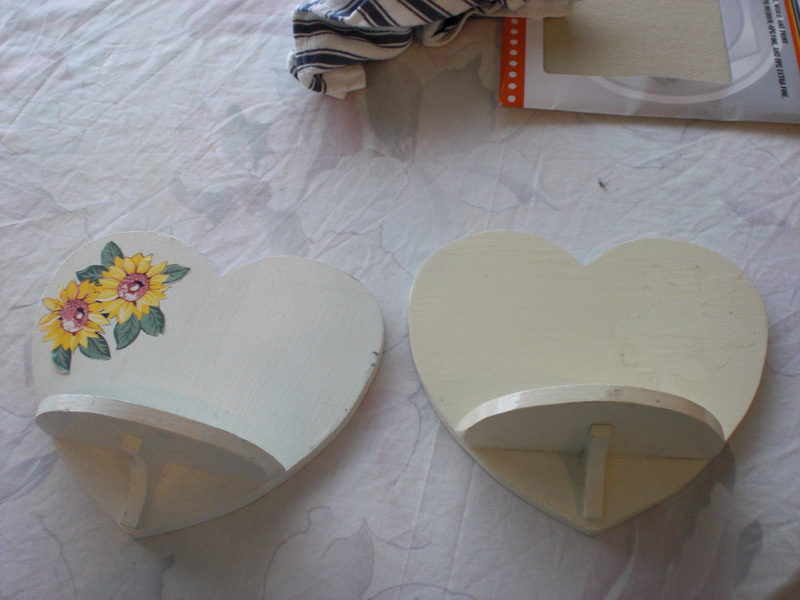 The heart shelves were my favorites! I knew I somehow wanted to use them in Baby Girl’s room, but I didn’t get the inspiration on what to do with them until recently! 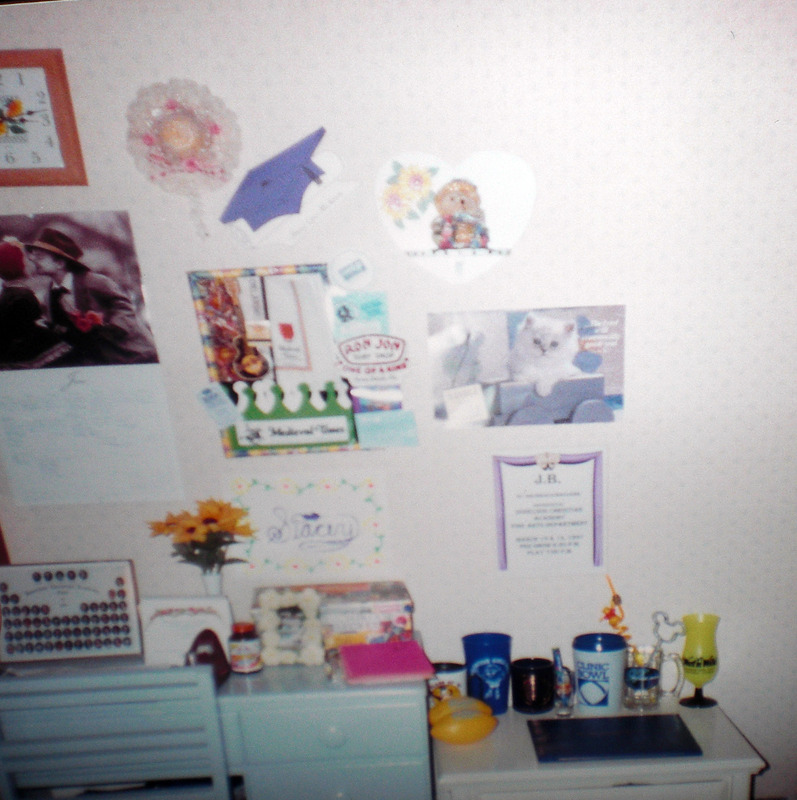 Here’s the shelves in my room when I was in highschool! Please don’t judge my poor sense of decoration. 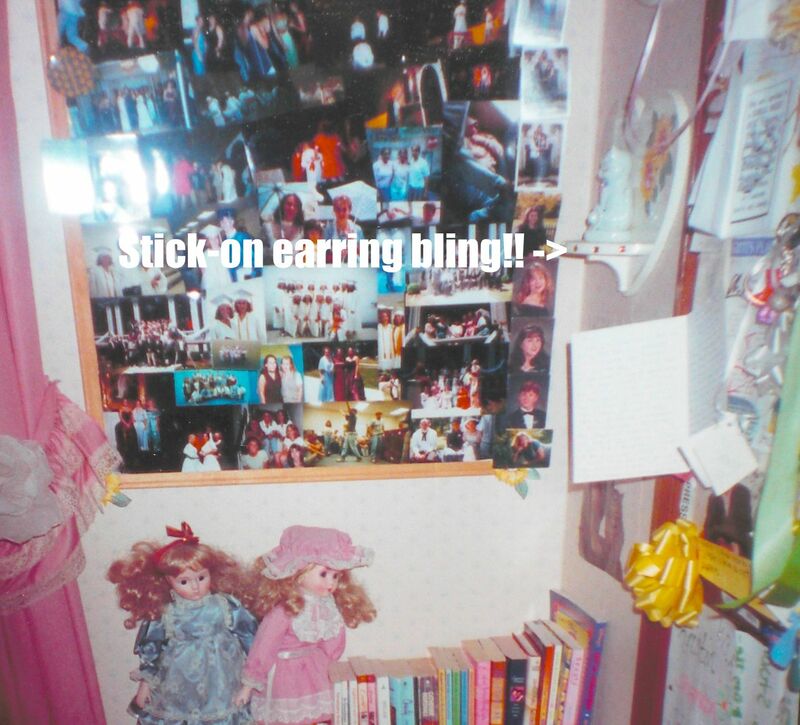 I was all about things that meant something, little souveniers from areas of my life, even if they didn’t go together! And trust me, my room had NO sense of a cohesive theme! Uhhh, yeah…..my style has changed a lot! Wait…I take it back….I finally got some style! I didn’t have it before! However, I was totally happy in my ignorance of style back then! I loved my room! 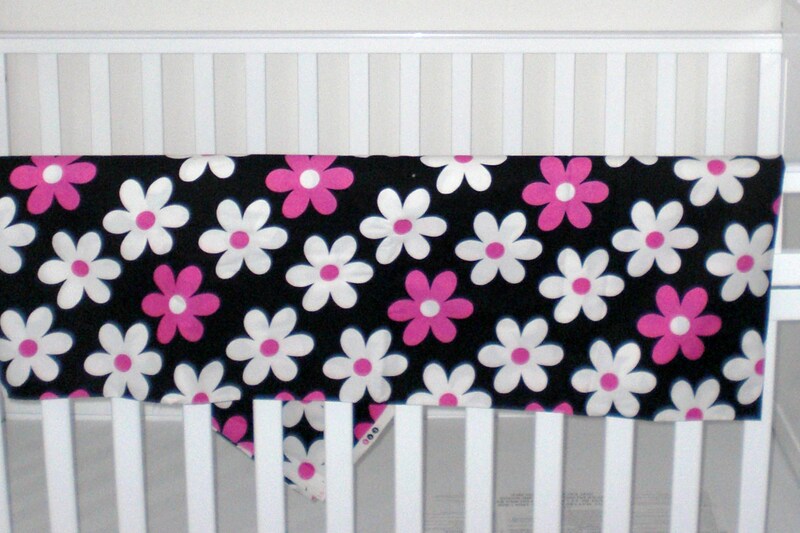 For Baby Girl’s room, I decided to go with painting them black, and using flowers from leftover material from her curtains and bed set to decorate them. Just like I decorated them long ago with sunflowers cut out from the paper that covered my bulletin boards. Lets just say this new idea looks a lot better than the old! Ummm, they aren’t even the same color! Please tell me they were when I used them! But I’m guessing they probably weren’t! 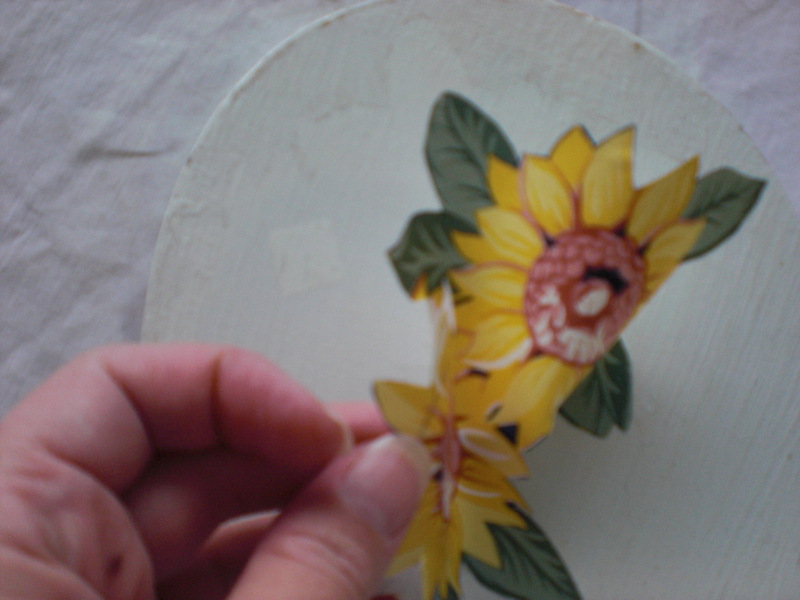 Then I removed the “contact paper” flower! Then sprayed painted them black! This took some time because the Krylon paint I got kept dripping and I had to wipe it off asap! So did the Krylon primer I had for another project. I think I’m taking them back to Walmart and buying some Rustoleum instead because it’s worked perfectly for other projects! I ended up finding an old $.96 can of black spray paint I’d gotten a long time ago and used it instead of the Krylon! Weird how the cheapo one worked better than the one I paid almost $3 for! Then I let them dry overnight, although they seemed pretty dry only a few minutes later! 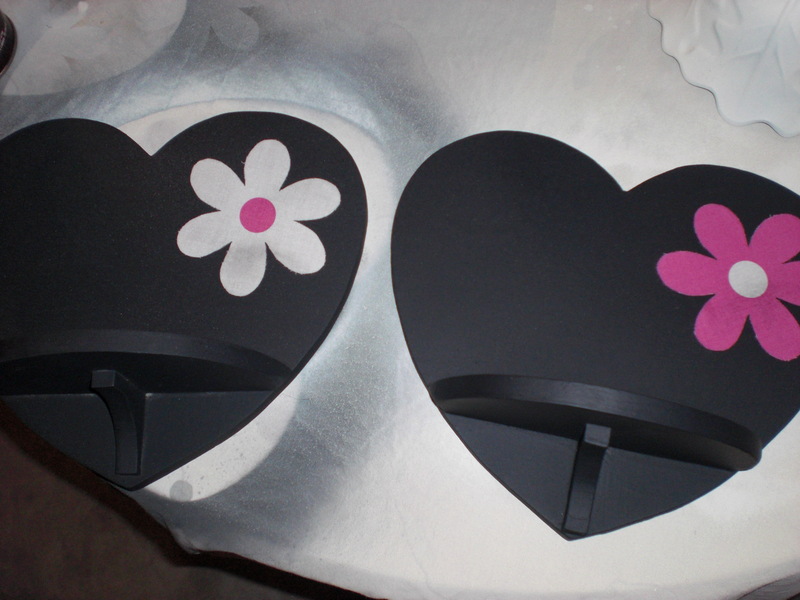 I sprayed the adhesive on the backs of the flowers, then positioned them on the shelves and smoothed them onto them. 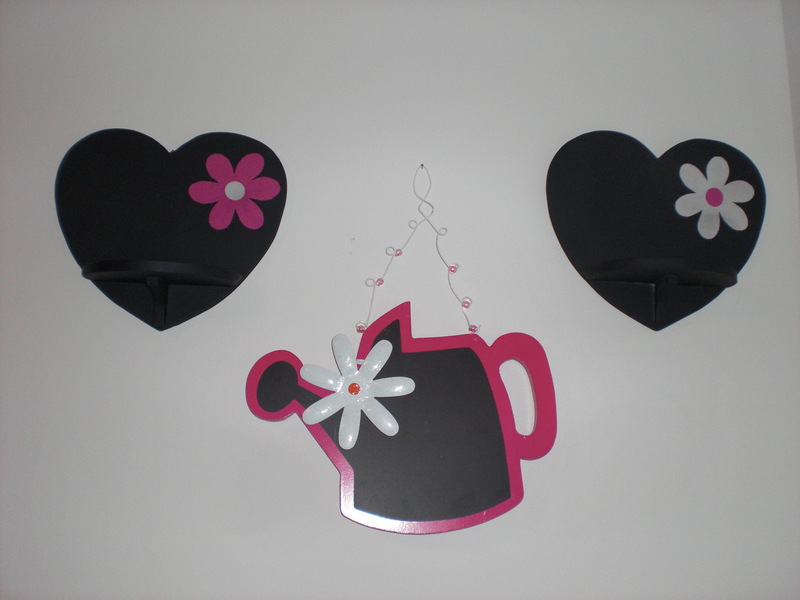 And here they are hung up in her room! Hard to see the “shelf” part now that they are black! I still have no idea what is going to go on them, but I kinda like them just how they are! They match so well with the flower pot chalkboard from Hobby Lobby! I still need to get a chalkboard marker so I can write on that! Maybe her name or something! Project #1 for Baby Girl’s room- COMPLETE!! Linking up with Just a Girl’s Show and Share day! and Shanty2Chic’s I made it without my hubby! Check out lots of amazing projects happening in blog-land! Along with all my fall projects (which are coming along nicely- I’ll post about those soon! 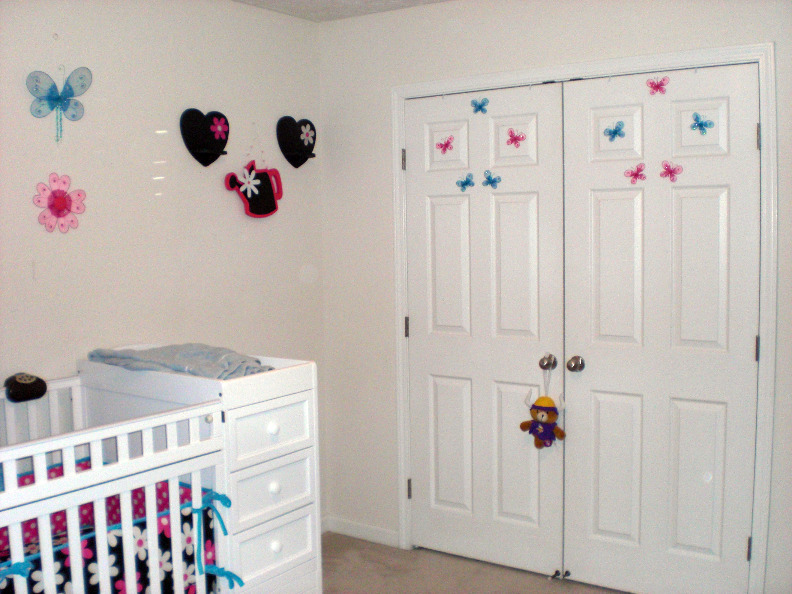 ), I have several projects that I want to do to Baby Girl’s room that had to wait until AFTER she was here! 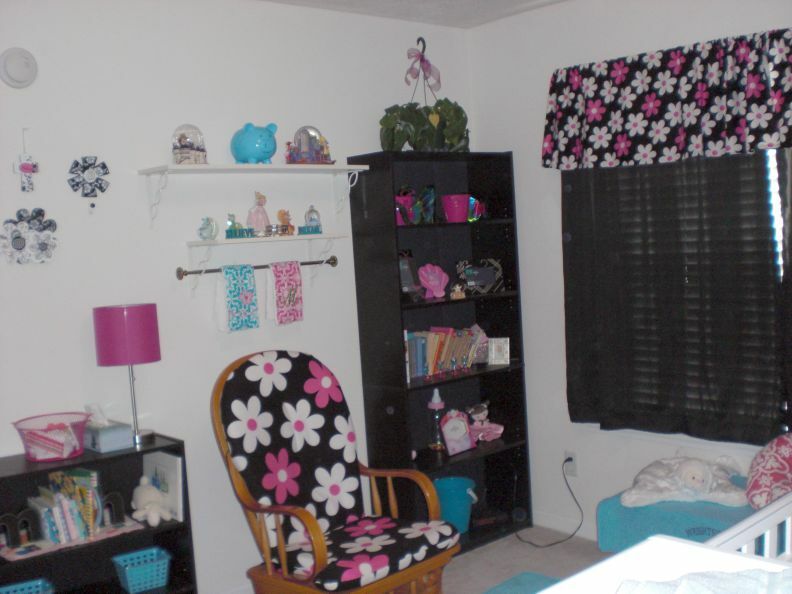 I have several things that I want to re-do or touch up in her room and since most involves painting, I decided to wait! Plus I just didn’t have the energy! It took me forever as it was just to decide on a theme for her room! I knew that I wanted Hot Pink, Black, and White – with touches of Aqua Blue. It was next to impossible to find anything I liked in stores or online, so I put my head together with my wonderful friend Chaundra and came up with her decor! (See that balloon way in the left corner? Yeah, it’s a day younger than her! Here’s my project list for this room! Put pictures in the frames! Lots of work to do, Baby Girl!! Yes, I gave up one of my very favorite things, but not of my own choice! I was about a month pregnant, and just starting to get morning sickness. I was drinking a cup of coffee every single morning, usually flavored with pumpkin spice creamer! I was also thoroughly enjoying a Pumpkin Spice Latte from Starbucks, when my wallet could afford it! Yuuuummmm!! I don’t know exactly how it happened, I just knew I could no longer drink it. It just didn’t taste good anymore! Although I had already switched to decaf, for the sake of my little baby girl, it was probably a good thing I gave it up!! Just this past week, fall has really started to creep in around here! It has been pretty cold in the mornings, and I couldn’t take it any longer! I knew Pumpkin Spice was back at Starbucks, and on Saturday when I was up at 5am to drive to a friend’s house to have a yard sale with her, I gave in. I’ve been wanting coffee again for awhile, but knew that I’d be “addicted” again if I gave in even once. So, instead I’ve enjoyed the occasional coke or sweet tea, but still mostly avoiding caffeine drinks. Really, I probably should just stick with tea or coffee since those do have some nutritional value. Pretty sure there’s no reason to drink coke, except for the fact that it tastes goooooooood! So, on a chilly 43 degree morning this past weekend, I caved. I sat in Starbucks drive through for at least 15 minutes, with only about 4 cars in front of me! I have no idea why it took so long, but that’s how bad I wanted it! It was worth….every…sip!! I am weak!! Fortunately, I think I can handle not splurging on Starbucks version too much! I plan to search out the coffee-mate creamer instead (hoping it is back in stores already! ), and also to make lots of visits to see the kids I used to nanny for as their momma bought some of the Starbucks syrup online last year and will make me FREE lattes. Decaf, please! At least for now!! Ahhhh, one of my favorite tastes of fall! I think I decided to rejoin the coffee club, just in time!! Like I mentioned yesterday, I’m looking for inspiration for fall by deviating from the normal yellows, reds and oranges, and leaning more towards, blacks, blues and creams for fall! Seems I’m not the only one!! Did you know there was such a thing as blue and gray pumpkins? I had no idea until I started looking around for where to find white pumpkins, and somehow came across lots of them! Here’s some places where I’ve found some inspiration…. 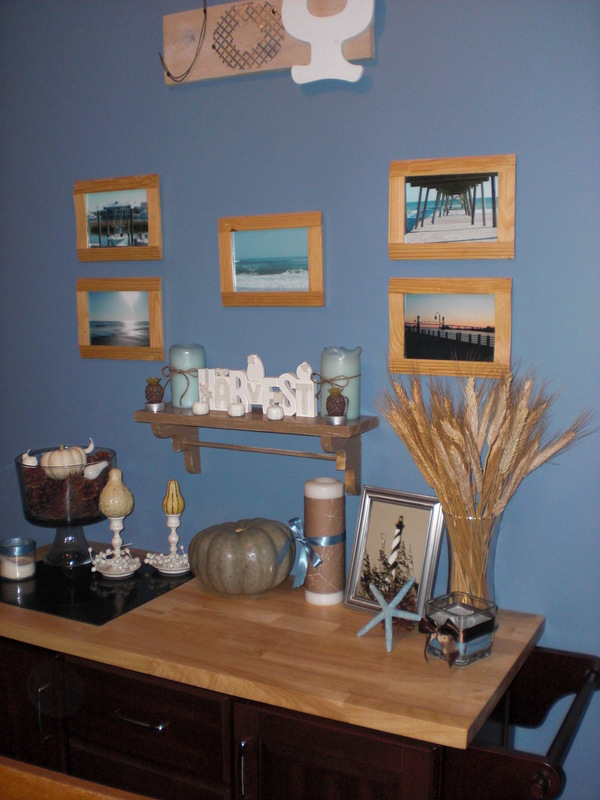 She uses lots of blue tones in decorating like me, although much lighter shades. Love how simple this is and not a bit of bright yellow, orange or red in sight! Also check out that fireplace that she covered in vinyl and drew on bricks with chalk!! She’s a renter like me, and she really knows how to make a temporary house a home! Ummmm…..completely adorable!! Not a project I’ll undertake since I’m not a sewer, but I want some of these! Maybe to cuddle up with on the couch! Love the shades of the same colors, the textures and just the total cuteness of these! If I had a place to hang it, I might make this! 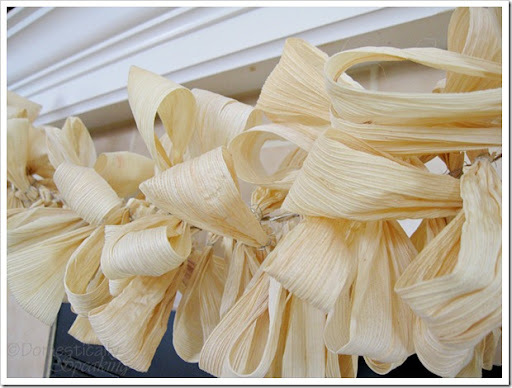 Corn husks definitely say fall, without having the fall colors I’m avoiding! A super easy Dollar Store wreath! Hmmmm…..I might have to add this to my to-do list of projects?? Loving the textures here, and the vases of wheat are fantastic!! I saw some gorgeous deep blue pumpkins at Hobby Lobby the other day. I almost snapped a picture and now I’m mad I didn’t!! I can’t stop thinking about them, so I think I may have to go get one!! Actually, I think the current one in stores is a deeper, brighter shade…..I’m in love! Why didn’t I snag it already?! Oh well, I have to go back anyways, and they are 50% off this week! Although I’m still in the mood for searching for inspiration, I think it’s time to call it quits! Ok…..Baby Girl is yelling at me that it’s time to quit!! 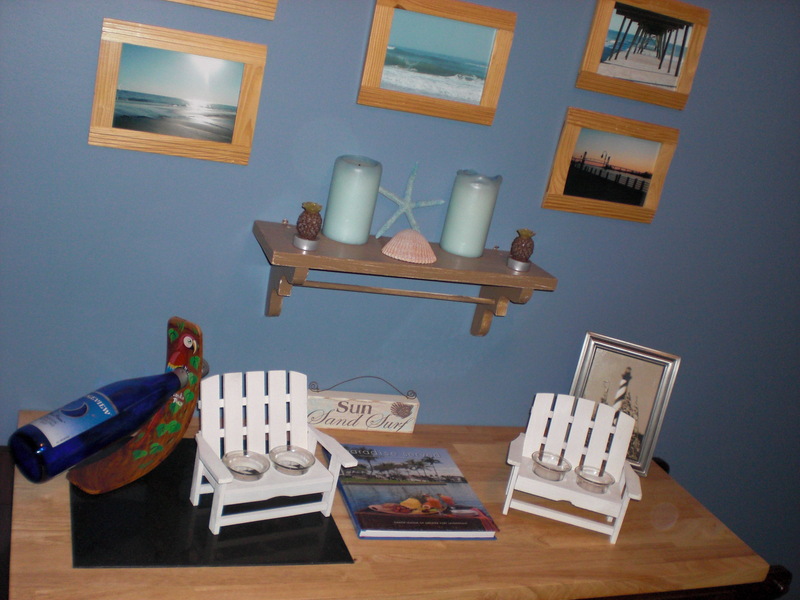 I also love to decorate for each changing season (except for maybe summer since my house is already pretty beachy looking!). My favorite part of fall has always been the smells! Apple and pumpkin candles, making apple butter and pumpkin cookies. And of course all the Thanksgiving smells! The problem I run across is that fall colors…..look HORRIBLE in my house!! I usually designate one little area where I put up the standard fake orange pumpkins, a bowl of pinecones with some fake glittery red, yellow, and orange leaves, a little scarecrow or two. 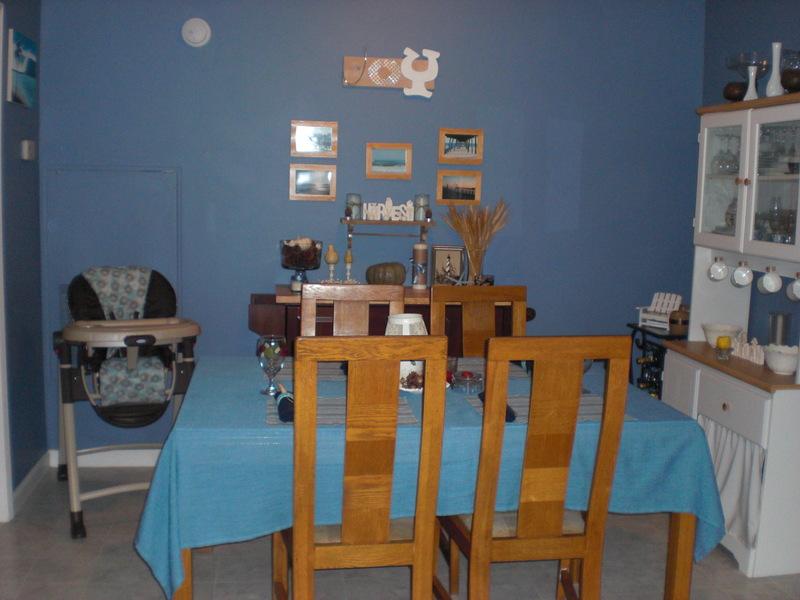 Among all my blue and black decor……ugggghhhh! It doesn’t look great! It didn’t really bother me in the past because I felt like it still got me in the spirit of the season! Now that I’ve been doing some research on fall decor that doesn’t have to be in those bright, primary colors that clash with my house, I’m even more excited about decorating! Here’s a few projects I have in mind- some of which I’m already starting on and will share once I do them!! 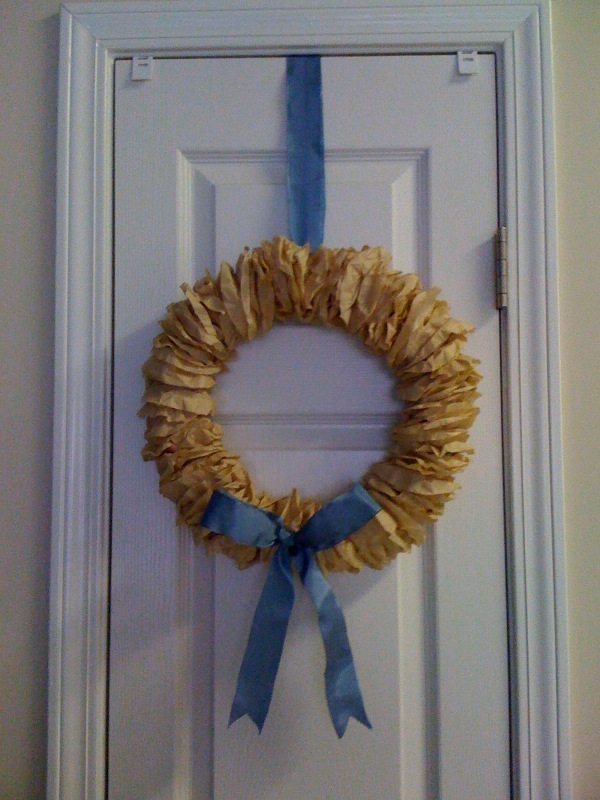 This wreath from Christina at Centsible Savings (who got her idea from The Little Brown House!) 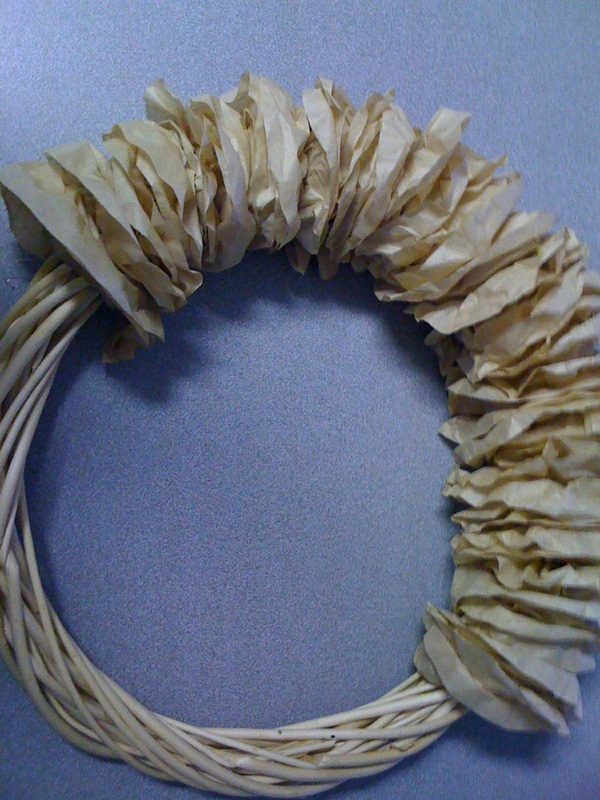 is made out of coffee filters and a wreath from the Dollar Tree, not counthing the ribbon, it costs a whopping $1.79! I already have the wreath, just need the filters (which I need to add to my Publix list so I’ll remember to get them one of the 5 times per week I’m there!!) and the ribbon! I currently have the glue drying on my first attempt at one of these! I’ve had some slightly skinnier vases leftover from my wedding for the past 2 years that I have tried to unload at every yardsale I’ve had since then, and I’ve never sold a one!! Now, I’m glad I didn’t! 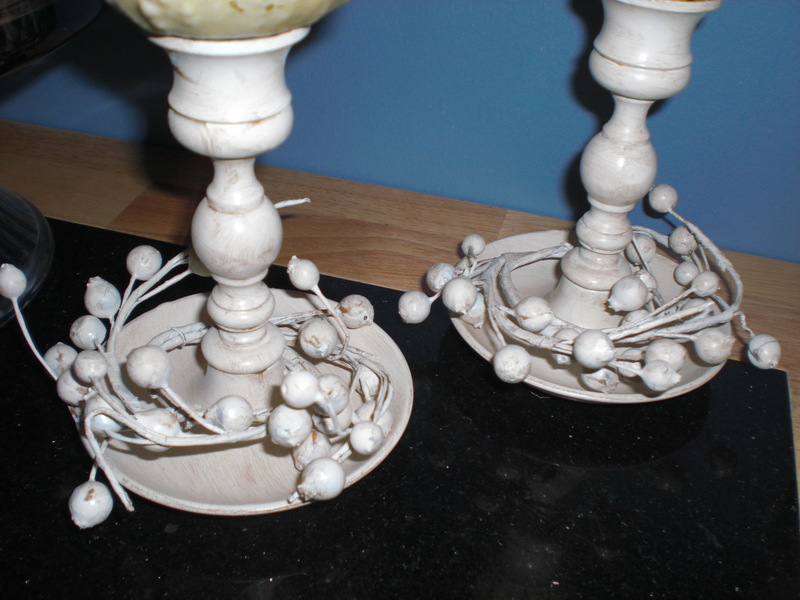 I bought some shorter candle sticks for these, and I need to go buy some larger ones two, I’m thinking two short and one large! 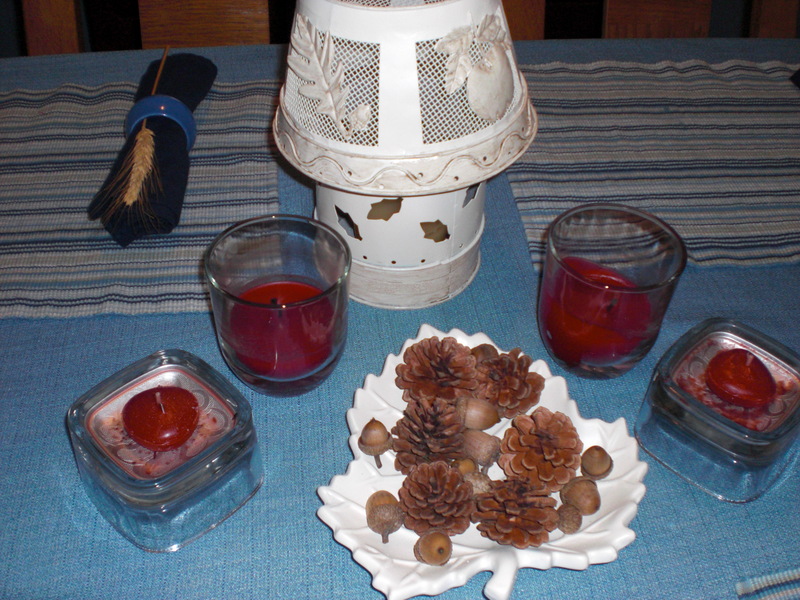 I plan to fill them with pinecones and mini pumpkins that I’ll also makeover by doing the next project……. 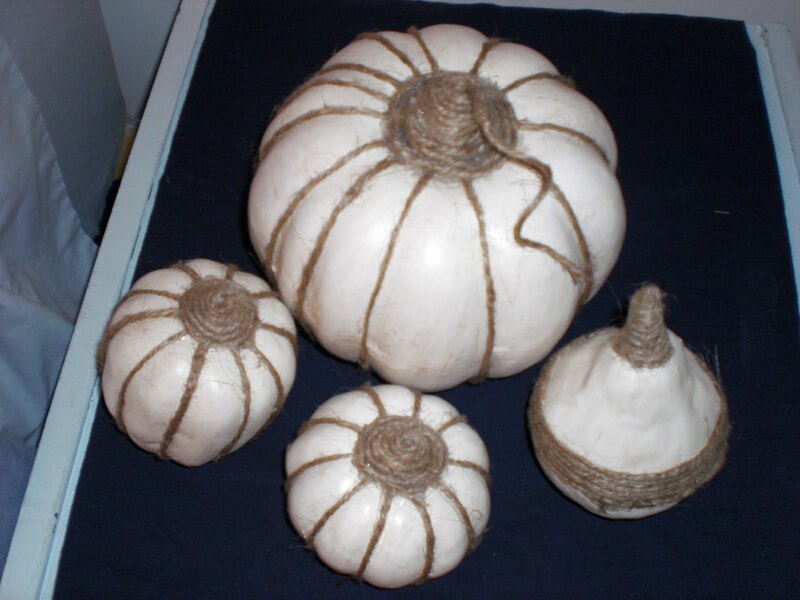 I’ve already got all the supplies for these adorable babies (except for the twine, which I’m not sure yet will work on my size pumpkins! 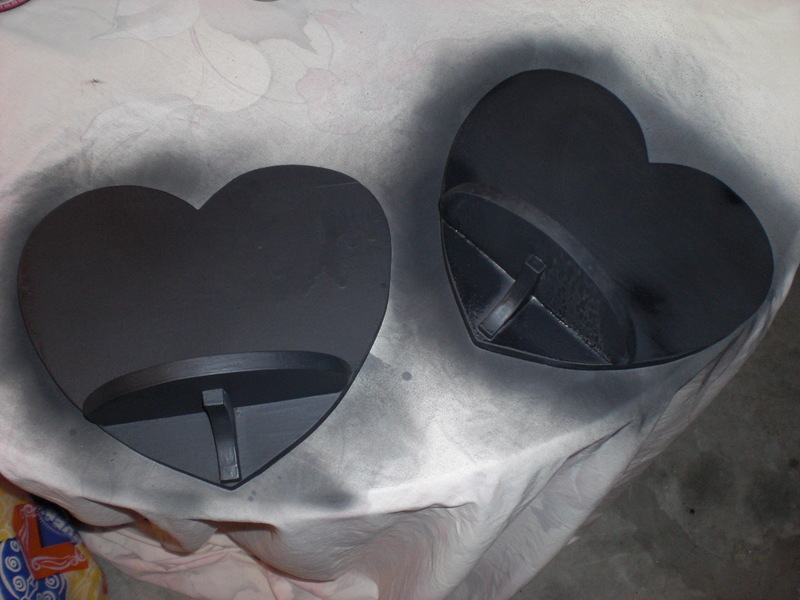 ), and I have already begun to spray paint them! I also have some tiny baby ones that I’ll probably put in the above hurricanes! Finally, I’ve started collecting supplies for these beauties, also made by Ashley from Shanty2chic! Again, I have almost everything but the jute twine, and I’m saving these for last out of all these projects since I think they will take the most time! I’m also not sure yet if I’m painting them black or Heirloom white! And they’ll be filled with something less Halloween-ish! Speaking of spray paint, here’s a great source of info on how to spray paint by Centsational Girl! 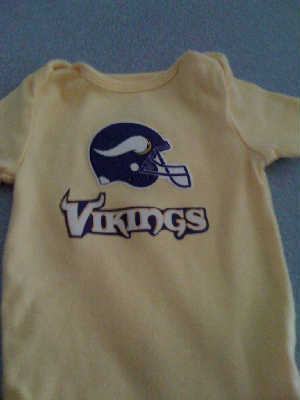 In an effort to save $$ but still support the hubby’s favorite NFL team, I did a search on eBay for Minnesota Vikings baby gear. There’s not a lot to choose from, and it’s either tacky or not cheap! There’s lots of official gear around the web that’s really cute, but who wants to pay $30 and up for an outfit she’ll wear once a week for a few weeks, then outgrow! So, I’d almost given up or decided to just fork over the cash for something cute but expensive, when I was going through her drawers and spotted a couple bright yellow onesies….in two different sizes! Aha!! What if I could make some iron-ons somehow?? I’m sure I could figure out how to D-I-Y making an iron on, but let’s check eBay first!! Two sets of these for $2.60 including shipping?? It took only a few minutes to iron on these puppies to her cute little yellow onesie! You can tell that the seller cut these out of a fabric with these symbols on them (perhaps bed sheets??) and added whatever material it is you use to iron on, but they look great! There is only one little area that is frayed where you can even tell they are material. And honestly, like I said, she’s going to wear these for just a couple weeks!! I made the first one on a size 0-3 onesie. Little miss is 8 weeks old in a couple days and is JUST growing out of her newborn clothes! Here she is ready for the game! In fact her pants here are size newborn! So hopefully she will have at least a good month and a half in this before I pull out her 3-6 month onesie and add the other set of decals to it! I’m wondering if I should go with white or gray on the next one just for a change? I have the same yellow and a gray in the next size and could easily find a white one! 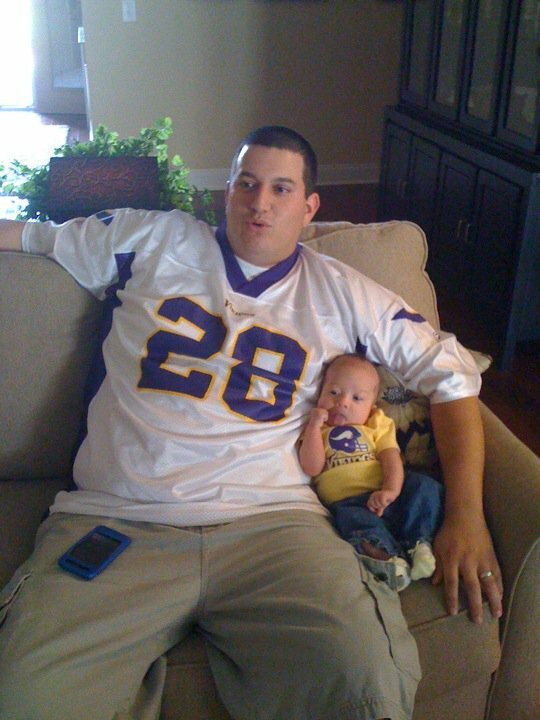 Unfortunately her shirt didn’t bring the Vikes any luck today. Maybe next time, Favre! 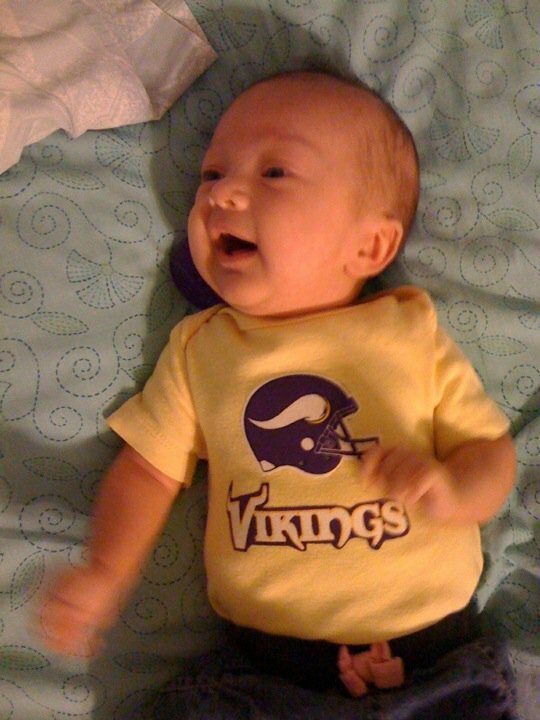 And mommy is looking forward to dropping some more preggo weight so she can fit back into her Vikings gear and all 3 of us can be decked out together! 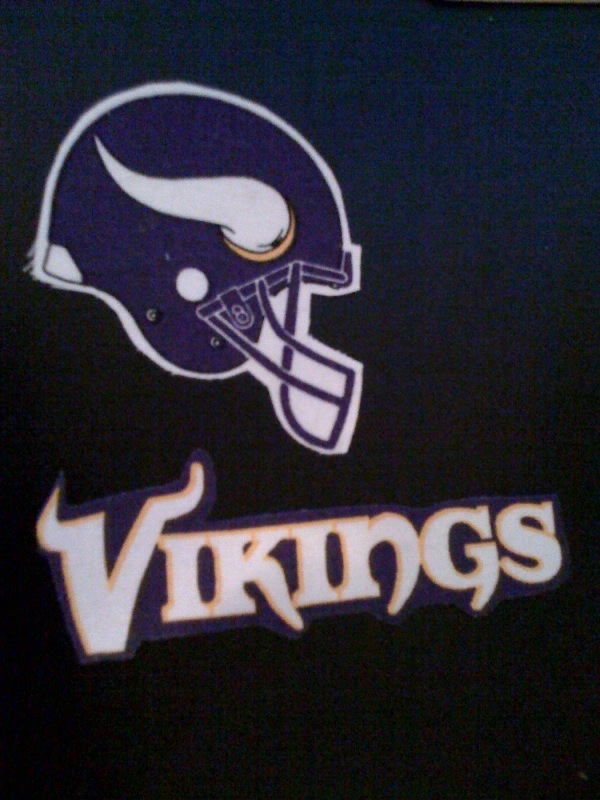 If you are interested in these iron-ons or those for any other NFL team, Disney, holiday stuff this seller has a lot! It looks like they might all be the same kind of iron-ons- made out of materials. 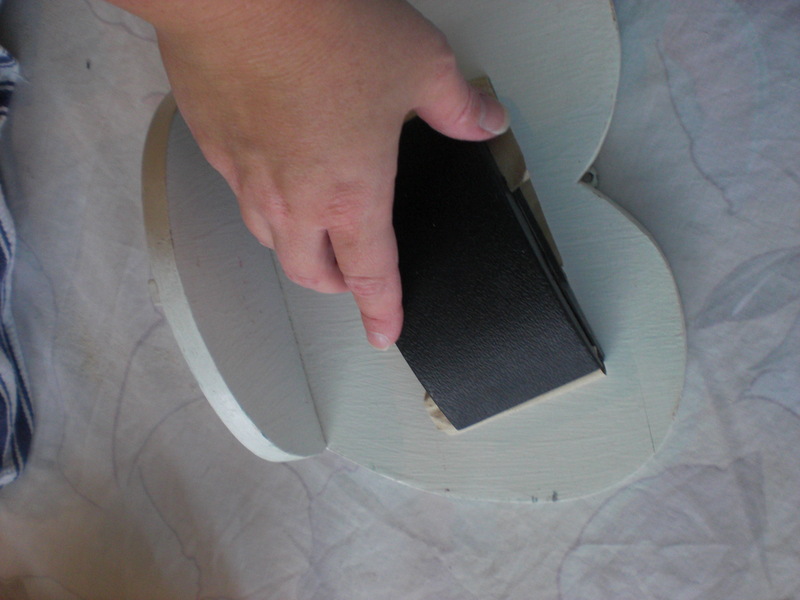 Yep, you could easily do this yourself, I’m guessing, but it was a super time saver for me! It would’ve cost me more to buy the supplies for it! Visit the eBay seller here!